The four directors were sentenced to between three-and-a-half and five-and-a-half years in prison. THREE FORMER DIRECTORS of the collapsed Icelandic bank Kaupthing were convicted for fraud by a Reykjavik court yesterday and sentenced to between three-a-half and five-and-half years in prison. The three men were convicted for hiding the fact that a Qatari investor used money loaned from Kaupthing to buy a 5.1 per cent stake in the bank right in the middle of the 2008 financial crisis. Hreidar Mar Sigurdsson, the bank’s former CEO, was sentenced to five and a half years, while the former chairman of the bank, Sigurdur Einarsson, was given a five-year sentence and the former head of its Luxembourg subsidiary, Magnus Gumundsson – who played a key role in granting the loan – was given a three-and-half-year sentence. A major shareholder in the bank, Olafur Olafsson, who approved the loan, was also convicted and sentenced to three years in prison. All four were found guilty of violating their ethical obligations and of manipulating the country’s stock exchange. The cash injection from Qatari investor, Mohammed bin Khalifa al-Thani, in late September 2008 was hailed by the management as a sign that the bank was on a sound financial footing. But just weeks later the bank collapsed as a wave of financial panic triggered by the fall of the American commercial bank Lehman Brothers in mid-September led to capital markets world-wide to freeze up. The investor, al-Thani, was threatened with legal action for not re-paying the loan and settled the affair in a confidential deal with the bank’s liquidators in February 2013. Iceland’s banking sector had ballooned out of proportion by 2008 compared to the size of the island’s economy, as the banks took out cheap loans abroad to fund a series of acquisitions. When international markets seized up and Icelandic banks collapsed, the country was forced to take a loan from the International Monetary Fund – the first by a western European country in more than two decades. A special tribunal later investigated the causes of the spectacular meltdown. In 2012 the country’s former Prime Minister Geir Haarde was cleared of all charges apart from neglecting to call his cabinet to discuss the collapse in time. The Icelandic banking sector is now divided into new institutions, confined to traditional banking activities, and the estates of failed banks which manage their debts, much of which has been bought by foreign investors at cut price. 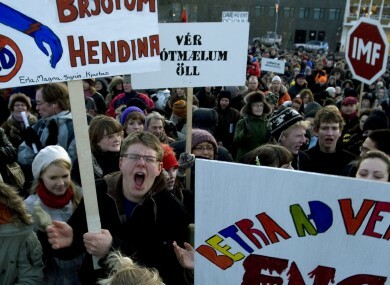 Email “Iceland jails bank officials for Kaupthing fraud”. Feedback on “Iceland jails bank officials for Kaupthing fraud”.